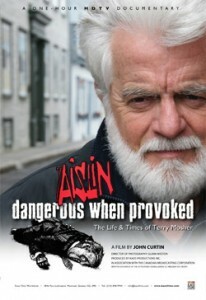 Aislin is the name of Terry Mosher’s eldest daughter, and the nom de plume he has used for over 40 as the political cartoonist for Montreal’s English-language daily newspaper The Gazette. Mosher is also the President emeritus of the Association of Canadian Editorial Cartoonists. To date, forty-six Aislin books have been published. His latest collection of cartoons entitled THE WRECKING BALL, with an introduction by Chantal Hébert, will be published in the October of 2014. Along with author Peter Desbarats, Terry Mosher wrote a history of Canadian political cartooning entitled THE HECKLERS that was published in 1979. A film, also entitled THE HECKLERS, and based on the book, was released by Canada’s National Film Board in 1980.